Welcome to ‘#imapiece of the week’, our weekly blog post showcasing some of the beautiful and thoughtful jigsaw pieces made by craftsters around the U.K in support of our Craftivist jigsaw Project for Save The Children’s Race Against Hunger. * Who are you and what do you do? I run the nuts and bolts of the Craftivist Collective and do my own crafty activism too for myself and sometimes as commissions. I deliver craftivism talks, workshops, exhibitions and random projects with organisations too (plus temp when I need rent money so I don’t have to say yes to craftivism requests I don’t believe in). * How do you get into craft? By accident. I was never taught it at school. When I moved to London my flat was too small to paint in and I was travelling a lot with work plus my job was very erratic and demanding. I found cross stitch as an outlet I could do anywhere and I loved the grid system (I’m a little OCD maybe) and feeling of being able to achieve something beautiful as a gift for people. Then I started thinking about how to link craft with activism and never looked back! * Why did you decide to get involved in the Jigsaw project? We are at a critical time when we could actually make an enormous difference to people’s lives across the world by showing our Government and the world that the UK public will not stand for a world that has enough food for everyone but still 1 in 7 people go to bed hungry even after a long days work. Save the Children have been successful in their campaigns in the past such as successsfully getting David Cameron to chair a Hunger Summit this year after the Olympics and they have ambitious targets to put hunger at the top of the agenda of the G8 next year which I believe they can reach with our help. Knowing that Save the Children have some of the best policy thinkers in the world and a team of campaigning staff working above and beyond to help the UK public mobilise and campaign, I want to support this campaign and believe that we can be part of this historic moment- I don’t ever want to think ‘what if’. * What have you stitched on your piece and why? 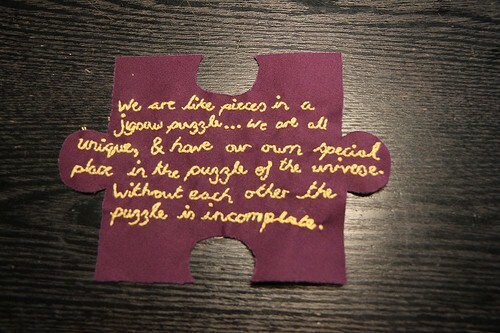 For the installation piece I’ve embroidered: “We are like pieces in a jigsaw puzzle; we are all unique and have our own special place in the puzzle of the universe.” because often we forget that our uniqueness can help fulfil the worlds potential and we have power and a duty to do so. * What do you love about craftivism? It enables me to combine craft and activism – which allows me to take the time to reflect on issues and injustices that I’m passionate about challenging, in a non-aggressive and non-preachy way.